Currently, the LDD2LDrawAddOn converter is only available for download in an uncrypted zip-archive. To use him you have to unzip the archive first. For this you should choose a directory that can be found easily. I, for example, choos the path C:\Programme\LDraw\Apps, next to all the other LDraw applications. After unpacking, you can start the converter with the LDD2LDrawAddOn.exe. You may also create a shortcut to your desktop or your start menu. The converter can even take it if you connect the lxf-files to him in the operating system. Than you can start him by double-clicking a lxf-file or choosing Open with -> LDD2LDrawAddOn in the context menu of the file (right click). Extras: There is only the update function availabe by now. Update (online): The converter tries to check for updates for the ldraw.xml and the l2l.xml and downloads them. External Applikation: Here you can managa external applications the converter should be able to start. Add Tab: Add a new tab. Remove Tab: Delete the active tab. Rename Tab: Rename the active tab. Help: Kind of self-explanatory :-). Below the menu there is the area, where you can choose settings that are necessary to convert a file. The most important information is which file should be converted. You can enter the filename with its absolute path in the textbox behind Input File: or choose one with the help of a file-chooser opened by the button (...) behind the textfield. After you have chosen a file to convert the converter suggests you an output file. Of course you can change the his suggestion. Again you can either enter the filename with its absolute path in the textbox behind Output File: or choose one with the help of a file-chooser opened by the button (...) behind the textfield. Additional there is a special feature: You can choose if your result should be a ldr or mpd file. Since the part libaries of the two systems (LDD and LDraw) have differences in their origin, orientation and part-numbering we need information to adjust them. These transformations and part-number mappings are deposed in a xml file: the ldraw.xml. If you own more then one you can choose whitch one should be used for the translation. At the first start the converter suggested you the delivered one. Inside the converter calculates with double precision, that means approximately 15 digits exact. You can choose how many of them he should write into the result file (Digits:). Default is four. After choosing the necessary settings you can initiate the conversion by pusching the button Convert. While the conversion the converter generates some kind of a journal where you can see what he is doing. After transferring a file form the LDD to the LDraw universe you certainly want to continue to work with it (render, visualize, animate, etc.). To keep this comfortable we added a possibility to configure and start external Applications from inside the converter. Each tab stands for a call of an external application. You can manage the tabs by the menu or the context menu (right click) in the external application area. 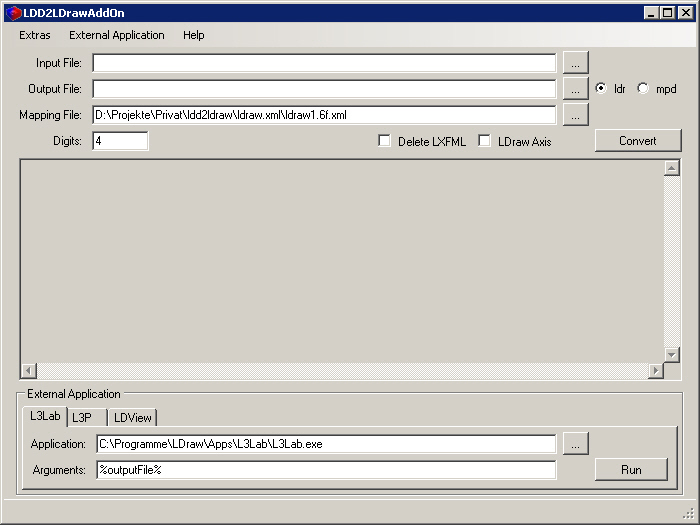 Inside the selected tab you can choose the application that should start by giving the position of its exe file. You may ether enter it directly into the textfield behind Application: (incl. absolute path) or choose it with the help of a file-chooser opened by the button (...) behind the textfield. In the picture, for example, I choose the application L3Lab (written by Lars C. Hassing). Who watched carefully may have recognized that %outputFile% is equivalent to %outputFileDirectory%%outputFileName%.%outputFileExtension% :-). One hint: If the filenames contains spaces you should use quotation marks (windows console like): "%outputFile%"! If I press the Run button now (settings from the pictures) the application L3Lab will start with the generated LDraw modell.